Talk to Timfraku, upstairs in a small house in the Tai Bwo Wannai Village. Firstly, speak to Timfraku, the chief of Tai Bwo Wannai on Karamja. He can be found upstairs in a small house just northwest of the start point of the Jungle Potion Quest. Tell him that Trufitus sent you, and he'll tell you to bring his three sons back to the village. Tell him that you'll try to help, and then leave the house. Each of the sons can be found in a different place on the island, and it turns out that each of them have an issue that they need your help with, before returning to the village. The best place to start off would be with Lubufu, an old fisherman located south of Brimhaven, just north of the narrow piece of land. Ask him who he is, and then talk to him again, choosing to talk about him. Ask him what he does, an then offer to collect bait. He'll tell you to fish in the Holy Lake south of the village, and that he needs 20 Karambwanji. Head south of the village to a small lake, and fish for Karambwanji with a small fishing net. After you catch 20 of them, bring them back to Lubufu and he'll take them from you. Talk to him again and he should ask if you want to be his apprentice. Say yes, and he'll give you a Karambwan Vessel and some Fishing Experience. Tamayu can be found southeast of the village wandering around the mines. He says that he won't return until he defeats the Shaikahan. Ask him when he'll succeed, and then ask to come along on his hunt. He needs more Agility and a better spear, as well as a way to keep it from healing up so quickly. 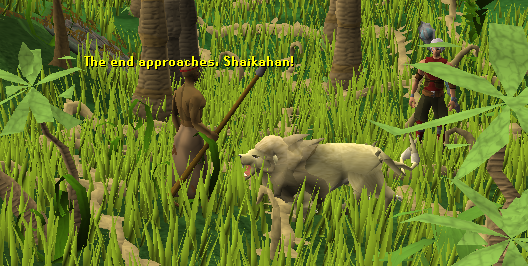 One Agility Potion (4 doses) should be sufficient to increase Tamayu's Agility enough to kill the Shaikahan. You will also need to obtain a Steel Spear or better. Tribesman sometimes drop Mithril Spears, and you can also buy them from other players. To poison the spear, catch a Karambwan by using a Karambwanji with the Karambwan Vessel, and then go Fishing for them at the spot near Lubufu. Now Cook it and grind it up with a Pestle and Mortar. Use the paste with the spear to poison it. Use each of the items with Tamayu, and then ask to go on the hunt with him again. He should be able to kill the Shaikahan. Talk to him again after he defeats it. He'll now agree to go back to the village. Tip: If you don't have 65 Fishing, you can trade with another player for a raw Karambwan. Tinsay can be found to the far south of Tai Bwo Wannai, on an island. You'll have to climb up the rocks and then cross the bridge to get to him. He needs to fix the Tribal Statue (strangely enough, located in the village) before he returns. He first wants a Banana in Karamja Rum. Pick a Banana from one of the trees on the east part of Karamja, and buy some Rum from the Bar for 30gp. Cut the banana with your Knife, and then use the slices with the Rum. Bring this back to Tinsay. Now he wants a Seaweed in Monkey Skin Sandwich. Take a piece of Seaweed from along the west coast. You'll need to either Range or Mage at a monkey to kill it since they're too fast for you to attack. Take the corpse and use it with Tamayu to skin it. Use the skin with the seaweed to get a Seaweed Sandwich and bring this back to Tinsay. Tinsay still isn't satisfied, and he wants some marinated Jogre Bones. Kill a Jogre, found east of the village and take its bones. Catch a Karambwanji and grind it using your Pestle and Mortar. You'll need to burn the bones in a Furnace , and then use the paste with them to create Pasty Jogre Bones . Cook the bones on a Range to get Marinated J' Bones , which you can bring back to Tinsay, who will now agree to return to the village. Tiadeche can be found to the far east of the village. Head over a log across the river, and then go north to the beach where you will find him. 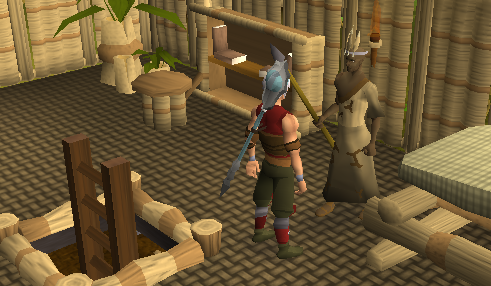 He won't return until he catches a Karambwan, and when you ask what you can do to help, he says "something useful." Use your Karambwan Vessel (with a Karambwanji in it) with him, and he'll catch a Karambwan. Now he wants you to bring a vessel to Tinsay so that he can make a manual for it. 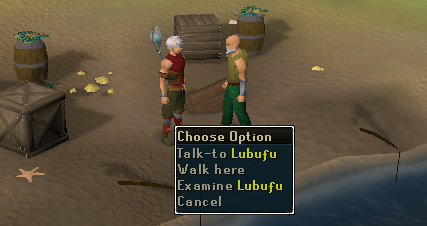 Head back to Lubufu and tell him that you lost your Karambwan Vessel (any option). He'll give you a new one, which you should bring to Tinsay. Use the vessel with him, and he'll write up a Crafting Manual for you to bring to Tiadeche. After bringing him the manual, he agrees to return to the village. Now head back to Timfraku, who will thank you for helping. Regardless of how your conversation with him goes, you will receive 2,000gp as a reward! Quest complete! Now speak to each of the sons who are now in the buildings in the south part of the village to collect your rewards. 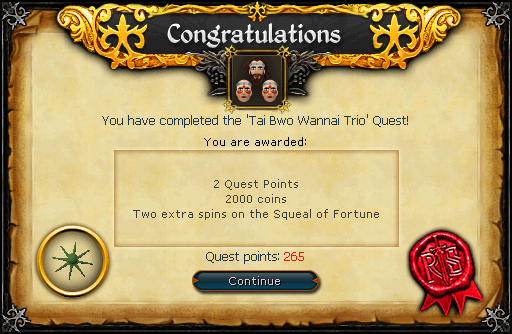 2000 coins 2 spins on the Squeal of Fortune Tamayu gives you a Rune Spear (kp), as well as 2,500 Attack and Strength experience. Tinsay gives you 5,000 Cooking experience, and he teaches you how to cook and marinate Jogre Bones. 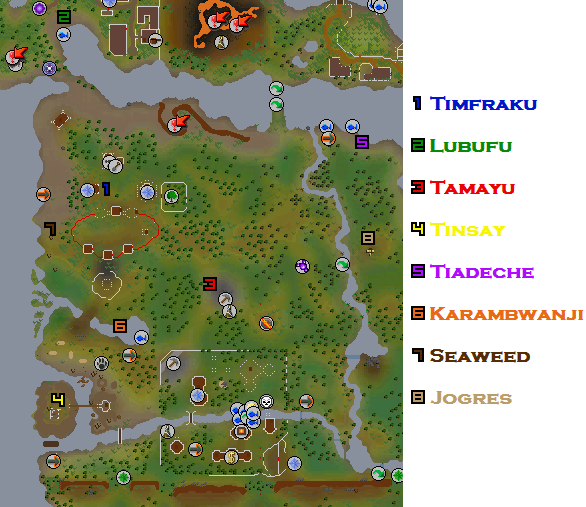 Tiadeche gives you 5,000 Fishing Experience, and he teaches you how to cook edible Karambwan. He will also sell you Raw Karambwan and Karambwan Vessels. [^] Cook karambwan; grind in pestle and mortar, poison spear with it. Use on Tamayu. [^] Slice bananas, use on rum, use on Tinsay. [^] Kill monkey, use corpse on Tamayu. [^] Kill jogre, burn bones in a furnace. [^] Grind karambanji in pestle and mortar, use on burnt bones; cook bones. [^] Head east, over log, north; talk to Tiadeche. [^] Back to village, talk to Timfraku.